I think he needs the A/C system wiring diagram for a 1997 (LHD) Saxo, as he has transplanted the A/C system from one of those into his AX. The key item is the connections to the 7 wire controller box pictured above. Ok, this is from a 1997 Saxo Diesel with A/C - specifically showing 8035: Passenger Compartment Temperature Electronic Thermostat (where separate). Note: Pins 3 & 4 show the same - this is not a typing error, and additionally, on the diagram you cn see they seem to link together. 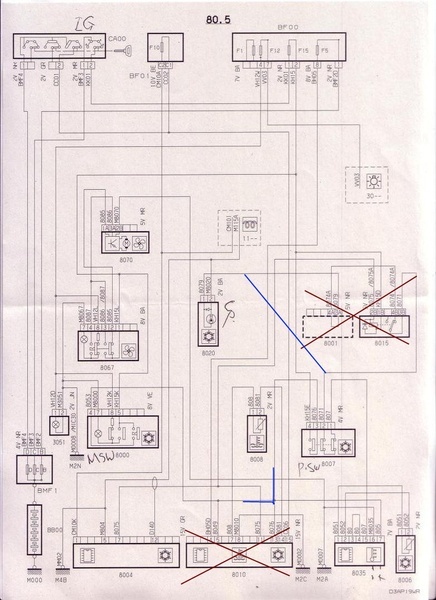 On tha larger Wiring Diagram, they do not show a destination as you can see. 8035 Passenger Compartment Temperature Electronic Thermostat (Where Separate). Many Many thanks now I can wire it up after so many hours. Thanks what does 8010 do exactly. I was making the wiring but, seems I don't have this computer? I am doing this A/C refit on a Carb car. I believe that this is some form of a coolant sensor on the radiator circuit. I think it is to avoid the engine overheating, so the coolant water is monitored by the air conditioning system. On some vehicles, if the coolant temperature gets to above 117°C, the compressor clutch is switched on and off at 20s intervals. If the coolant temperature exceeds 120°C, the electromagnetic switch is switched off until the temperature drops below 117°C. The clutch then cuts in once again at a rate of 100%. This is a generalisation - and each A/C system will be different - more modern systems don't have this specific module, the function is probably an integrated into the newer electrical systems. As far as I can see, 8010 is the cooling fan controller, and when it detects overheating it shuts off the A/C compressor clutch via relay 8015. If you feel you need a similar function, you could drive a relay from the overheat warning light (assuming you have one). I omitted the 8015: Compressor Cut-Off Relay Controlled by Coolant Temperature Unit (8010) and 8001 the Relay Shunt - I'll edit the previous table to include it. I don't know if the older carb cars had such a computer to turn the fan on. Normally its just relay and fan switch and fan. Could I use a 2 pin low pressure switch for this? If yes how to wire? 8067 Seems I dont have a recirculate function / bypass this function? I really couldn't say, all the systems are different and moreso on later cars - I really can't advise you on the wiring as this is a retro fit and from a different model - mine is a computer controlled climate system, so completely different. Have you thought about contacting a local automotive Air Conditioning engineer? That might be your best option. If your car currently has a single-speed fan controlled by a simple thermal switch, then the "period" means of actuating the fan from the A/C is to add a relay across the thermal switch that brings on the fan when the compressor is requested by the compressor controller. The coil for this relay should be connected directly to the compressor controller (before the compressor cut-out relay) so that the fan is kept on in the event of over-pressure in the A/C system. They don't want to tell and just keep hammering you need a custom a/c just upselling. Yes it only has single speed. I was think adding a second fan building the cooling system into a ''push-pull'' configuration and only use the second fan as A/C fan only. With the 8010 you mean this relay right? I have assumed that you are using the Saxo dashboard switches and A/C blower controller (things can be simplified further if you are not). 8007 is the A/C pressure switch, I have shown only the compressor cutoff contacts connected, the other set of contacts, should really bring on the cooling fan. 8015 is still the compressor cutoff relay (in case of engine overheating) The sense of the wiring to the relay coil will depend on the overheat sensor on the AX. 3. The A/C pressure switch (second contacts) should bring on the cooling fan (not shown in the diagram in this post). May or may not be of any use, but here is the basics of a twin-fan cooling installation, with relay added for triggering low-speed when AC is switched on. Uses a standard radiator thermo-switch. Dash LEDs and manual switching is an optional extra. Circuit equates to the standard 3-relay arrangement on many Citroens.